I have been seeing these posters all over Hamra and I am really curious to what they are about! 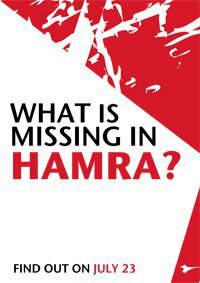 Everyone knows how much I love Hamra so I am really excited to know what it is about. There has never been something like this in Hamra. Some people are guessing a public library, a theater or a cinema, free parking, a concert, etc... What do you think it is? Update: HINT #4: "Many of you expressed very valid hopes and wishes we all share for our home, cocoon, first and last love; our Hamra. But seriously, who'd campaign for parks/freedom of speech/benches/free parking/public bathrooms/etc etc... with an event on a Saturday night that starts at 10:00 pm and ends at 6:00 am Sunday morning? That was clear from the start, and we make no apologies to the misled. We all want our Hamra to be a constantly improving place. We can and will do our utmost to achieve that, but that won't stop us from having a lot of fun in the meantime. In Hamra!" Hamra already has a lot of those! and it is true Hamra is missing a clubbing venue most of lebanon is! where you can put on some sneakers and just dance and dance!